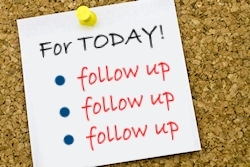 Timely, effective event follow up can be the difference between yielding just average results and achieving great results from your trade show participation. Your event has finished, the exhibition stand is being packed away and you have gained numerous strong leads. But the hard work hasn’t finished quite yet, you must now analyse the success of your event, follow up leads and use your experience to prepare you for your next event. The most important part of post-show analysis is to do it as soon as possible after the event, while the experience is still fresh in your mind and that of your leads. Hopefully you had a good lead capturing and scoring system in place during the event, this will make prioritisation of post-show tasks easier and allow you to focus your efforts on leads with the most potential. If you were capturing leads on a landing page integrated with your CRM system, they should be imported automatically. If another method was used, such as QR code scanning or collecting business cards, then this may have to be done manually. Useful information to include would be the grading score of the lead, a note on which trade show contact was made, which personnel spoke to them at the show and any specific questions they may have asked. You should assign leads based on the grading score you have given them. Some may be more obvious than others, and the type of outreach used should be based on this grade. If appropriate, assign leads to the person they spoke with at the show. If leads have provided a phone number and they are considered hot leads, a phone call is the best course of action for event follow up. All leads, both good and marginal, should be sent an email shortly after the show that thanks them for stopping by your booth, provides information to reinforce your business values and offers an invitation to reach out. You should then follow this up with a longer term email campaign providing valuable information in the form of blog posts, industry insights, free resources and product offers, where applicable. If the contact has asked a specific question, shown interest in a particular service or product you offer or raised any issues, personalise your email campaign to address his or her needs. Once you have contacted all leads, followed up and gone through the process of converting to customers, you will be able to look at the attributed revenue to get a feel of the ROI from your event. If you first divide the cost of the show by the number of leads, this will tell you the cost per lead, which is a good figure to have when looking at future shows. You can follow the logical progression of getting the cost per converted lead and finally the direct ROI from those conversions. It is useful to split the ROI into time periods, so you can tell how long it has taken you to cover the cost of the show. This will help you decide on budgets for how many shows you want to attend in a given time period. As well as the financial data, there are also other factors to consider when looking at the implicit worth of a trade show. The advertising and branding of your stand, networking with like-minded people and picking up any industry information about the competition and suppliers. This could all result in converted customers, who were not captured as a lead, so are hard to quantify in your ROI calculations. What went well at the show? Could the stand equipment and branding be improved upon? Who had better stands and what did I learn from other stands? How did the staff perform? Was the lead capturing and scoring system useful? Were there any issues or questions raised by potential customers? By answering these questions, you will be able to put together a strategy for your next trade show that reduces problem areas and improves upon what works well.